A Borboleta Loba é uma espécie univoltina que se encontra em vôo desde o início de Junho até final de Outubro. Os ovos clolcados em gramíneas eclodem ao fim de três semanas. As lagartas alimentam-se durante o dia e hibernam por entre a vegetação. Em Junho do ano seguinte o ciclo recomeça. The meadow brown is a univoltine species, which means that one generation is produced a year. The adults are on the wing from early June to late October, and females lay eggs on grasses. The eggs hatch after around three weeks and the caterpillars feed throughout the day and overwinter among the grass stems. Adult butterflies emerge in a month, starting the whole cycle once more. 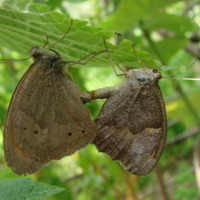 Adriana Galveias (fotógrafo), “Borboleta Loba,” MUHNAC Digital, accessed April 19, 2019, http://digital.museus.ul.pt/items/show/172.